Take note from self-publishing Outskirts Press author, Andrew Rodriguez, who is taking his latest book, Mediocrity in AMERICA: A Point of View, on tour — a virtual book tour, that is. He will be featured on several blogs over the weeks and months ahead so keep your eyes peeled to learn more about him and his book. Luckily for us, Andrew was kind enough to answer a few questions as the tour was getting started so that we can give you a sneak peek into the mind of the creator of Mediocrity in America: A Point of View. OP: Tell us a little bit about Mediocrity in America: A Point of View. What is it about? Andrew: In my book, I examine the cause-and-effect relationship between generalized mediocrity and American democracy. I also look at democracy’s core values and traditions, as well as the factors upon which, ultimately, its very survival depends. Andrew: I wrote Mediocrity in America: A Point of View in order to leave a legacy for future generations. My book is intended to remind readers of the fragility of freedom and to describe the possible disintegration of a prosperous, civilized society. I also wanted to offer counsel in an interesting, perhaps sardonic way on how to prevent social apathy from destroying our country and Western Civilization as a whole. There is a truism which I have often heard expressed, which says: “Democracy’s worst enemy lies within itself and not beyond its borders.” I wrote my book in order to open the eyes of the ignorant and ill-informed to the heart of this matter. Andrew: Mediocrity in America: A Point of View is a timely book. Hence, instead of wasting precious time and resources seeking conventional publishers, I decided to speed up the process by self-publishing it through Outskirts Press, which is based out of Parker, Colorado. Andrew: I firmly believe that my book will appeal to those who love America and the moral pillars upon which it stands. 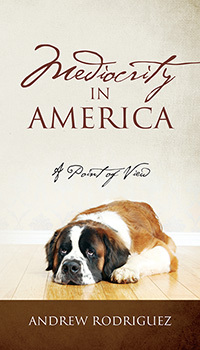 Andrew: The “point of view” referenced in my book’s title refers to Titan, a St. Bernard. Readers are led to see the world through his eyes, as he is presented with a wealth of information regarding the effects of widespread mediocrity—information which offers much to consider if America is to remain one of the greatest nations on Earth. Titan weighs in on the effects of envy—as well as the other six deadly sins—and on vulgarity. Titan reflects upon the Humanities and offers his canine point of view on what he considers the scourge of our nation: Indifferent human beings sleepwalking through the various phases of life without teaching and without learning. Titan comes to understand that the greatest catastrophe occurs when bored and boring citizens such as these grow to immeasurable numbers and become the majority—providing the perfect environment for a dogmatic, narrow-minded, and inflexible group to fill the vacuum and establish a paralyzed society prone to disintegrate as mediocrity becomes its foundation. This unique and thoughtful narrative is as spot-on as it is entertaining, and Titan as a benevolent narrator makes a compelling case against the dangers of mediocrity in America. Andrew: My book is slimmer than most, and makes for a quick and easy read. Its message is user-friendly, simple, and straightforward. Andrew: Yes, I have! My first book was The Teleportation of an American Teenager (2005). Later that year I also published the memoir Adios, Havana, winner of the 2006 Colorado Publishers Association’s Evvy Award for its genre. I also published The Incredible Adventures of Enrique Diaz (2006), a work of historical fiction and finalist for both the USA Book News’ Best Book Award and Foreword Magazine’s Book of the Year Award. In 2009 I published the mystery romance Helen’s Treasure: Odyssey of a Ladies’ Man, and in 2014 I published a collection of short works, Santa Rita Stories: Coming of Age in a Cuban Fishing Town. Mediocrity in America: A Point of View is my latest book, published in 2016. Andrew: As an obsessive writer and student of the human condition, I will continue to publish many more! OP: Thanks for your time, Andrew! We look forward to learning more about you as you visit other bloggers! Andrew J. Rodriguez is also the author of Santa Rita Stories, Coming of Age in a Cuban Fishing Town; Helen’s Treasure, Odyssey of a Ladies’ Man; and The Incredible Adventures of Enrique Diaz, a finalist for both the Book of the Year Award sponsored by Foreword Magazine and the Best Books Award sponsored by USA Book News. His second book, Adios, Havana: A Memoir, won the prestigious Colorado Independent Publishers Association EVVY Award in 2006 as well as the Allbooks Reviews Editor’s Choice Award. Rodriguez and his wife live in Colorado and Florida. Previous Previous post: This Earth Day, consider Eco Friendly Book Publishing with Outskirts Press!